Contemporary Vienna is a vibrant city with a population of about 1.6 million. 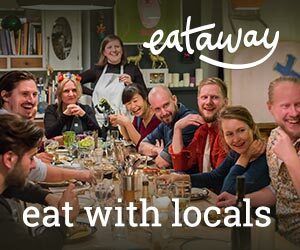 It's certainly not the biggest city in the world, but as in so many countries, the capital has a bittersweet relationship with the rest of the land, prompting many wry remarks over the beer tables. Salzburgers tend to think that they are more authentic, noting that every other Viennese is called 'Nowak' (a Slavic name). This is a legacy of the Habsburg empire, when Vienna assimilated thousands of foreigners into the fold. Perhaps unsurprisingly, the Viennese are not overly troubled by inferiority complexes. Though formally dissolved in 1918, the empire still sets the tone in Vienna's exuberant architecture. Unlike many European cities, Vienna has managed to come through the centuries relatively intact, and it endures as a tremendous treasure trove for art lovers. The museums are exceptional, the churches magnificent and the respect for heritage paramount. That said, Vienna has seen some major changes over the last decade. For fifty years, Vienna was a somewhat sleepy outpost on the outskirts of the economic West. When the Berlin Wall fell in 1989, Vienna became a Central European city again. A second boost came in 1995 when Austria joined the EU. Vienna is formally divided into 23 districts. As in Paris, these all have their historic names, and numbers are most often used to differentiate between them. Most Viennese are brought up in the Roman Catholic tradition, although in a recent poll, a quarter of the inhabitants professed no religious affiliation. There are sizable Orthodox, Muslim and Protestant communities. The Jewish population, once so dynamic, was all but extinguished during the Second World War, and many Jews who had emigrated during the 1930's did not come back. Today, Vienna is the seat of many international institutions, including several key posts of the UN. An increasingly cosmopolitan atmosphere has emerged, and current mayor Michael Haupl is striving to bring back the artistic climate that once brought the city renown. The Museumsquartier, one of the world's largest cultural complexes, opened to great fanfare in 2001, and continues to go from strength to strength. The origins of the word Osterreich (eastern empire, or eastern realm), stretch back over a thousand years to the era when the Austrian lands were joined to the Holy Roman Empire. In AD 966, a document marked the existence of the Ostarrichi domains. Austrian power on the world stage reached its zenith under the Habsburg dynasty, who reigned from 1298 to 1918. The Habsburgs really got into their stride in the sixteenth century, and the defeat of the Turks at the gates of Vienna in 1683 saved Austria from disaster. Austria remained a major player on the world stage, with the Habsburgs piecing together a vast swathe of Central Europe. Vienna provided the location for the famed Congress of 1814-15, when the kings, dukes and princes of Europe tried to undo the changes that Napoleon had created. However, in the age of rising nationalism, the Habsburgs struggled to keep their Empire under control - concessions to the Hungarians, Poles and fellow nations were introduced. After losing the First World War, Austria was divided up amidst the clamour for independence of the nation states. The Austrians voted to be joined to Germany, but the Allies declined, wary of a swift return to power. The 20's and 30's were a trying era, and Austria was ultimately absorbed into Hitler's German Reich in 1938. Hence followed one of the blackest periods in Austria's history. 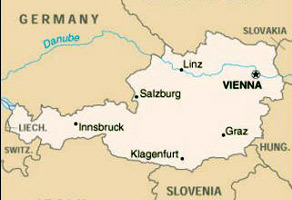 After the Second World War, Austria was temporarily administered by the Allies, with Vienna itself divided into French, Russian, English and American zones. However, fortune turned in Austria's favour and the country was not subjected to long-term Soviet, or indeed any other other form of foreign rule. In 1955, the Allies agreed for a withdrawal and the Republic of Austria was declared. Today, Austria is one of the wealthiest countries in the European Union, with a high standard of living. It is a land-locked country, bordered - following the arm of the clock - by the Czech Republic, Slovakia, Hungary, Slovenia, Italy, Switzerland, Liechtenstein and Germany. Austria's landscapes endure as amongst the country's leading attractions, and the Austrian stretch of the Alps remains a favourite with skiers. Politically, the country has been a democracy since 1955, but it has not all been plane-sailing. Waldheim's late 80's presidency sparked controversy, whilst the Far Right caused a rumpus in 1999 when they gained 27.2 per cent of the vote. In 2006, the socialists returned to power, with the Far Right vote shrinking to 15%. However, as a democracy, Austria's post-war Human Rights record remains impeccable. I loveeee Vienna!!!! Beautiful city, nice people, good atmosphere..
A great city. I would like to live in Vienna for a couple of years, but not in winter. What type of weather will it be by end of Jan'09 I am visiting Vienna for a week.